Welcome bloggers to my Tutti Designs blog. Hi, I am Nancy and I am so excited to share with you here each Tuesday, my cards and projects using another Tutti Designs die. Today, I am using the gorgeous Tutti Designs Poppy. Isn't it gorgeous. I cut out two poppy flowers using a pink card stock and two poppy flowers using a pink texture card stock. I colored the stamens inside the poppies with a black Copic marker. I glued the pink poppy onto the green die cut and the pink texture outline of the poppy on top of the pink poppy to give it more of a 3D look. I used Ranged Gold Liquid Pearl for the center of the poppy. Since the die has one poppy, I cut out the poppy flowers with the same pink card stocks and another cut with the stem using green card stock and glued it on the green die cut. Be sure to check each day to see what our talented Tutti Designers have created for you on the Tutti Designs Blog and see more cards and projects visiting the Tutti Designs Facebook and Tutti Designs Pinterest. You'll want to be sure to pop over to the *NEW* Tutti Designs Store and check out all the beautiful dies in their first release. Reminder to visit the Tutti Designs Blog to see what our other designers have created for you and I would appreciate a comment and if you have any questions, don't hesitate to ask. Amazing flower and wonderful card. Love it! Yes, this is very gorgeous!! Your card is so classy and so stunning! I love the little bouquet you've created. Beautiful all over!! BEAUTIFUL creation Nancy! Love the pretty pink color and your design is fabulous! GREAT job! Beautiful card Nancy ... love the way you arranged the poppy dies to create a bouquet! Tutti Designs Golf Bag, a rare mens card. A Vintage Feel with Tutti Stacked Butterfly Cups. 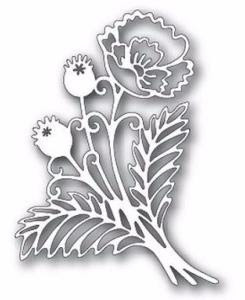 Sparkly Tutti Designs Poppy Edge Die. Tutti Designs Tree Of Life.